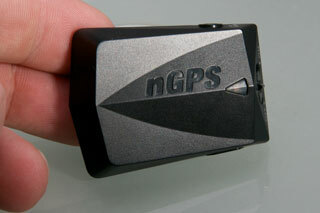 BuyGPSNow have kindly given us one of the new $109 Columbus nGPS geotagging devices to review. BuyGPSNow are also offering a 20% discount for PocketGPSWorld.com Subscribers worth over $21. Subscribers can click here for details. 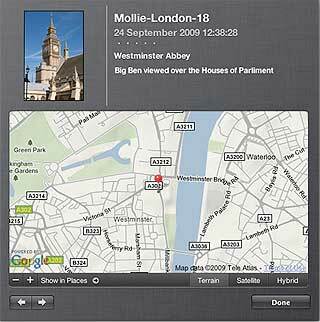 The term geo-tagging refers to the use of a GPS device to record your location into the digital image file from your camera. The nGPS device constantly monitors your position and when you press the shutter adds the location information to the data recorded alongside the picture. Wow! That sounds a bit technical but basically you don't need to worry about it too much. Just like the date and time of the picture are stored with the image so is a lot of additional information including Camera Make, exposure details, focal length etc� This is based on a globally agreed standard known as EXIF data, and positional information is part of that standard. Unfortunately most cameras do not have a GPS interface so this information is left out. It is possible to add it in later using a number of different means such as track matching to a datalogger, but this is a tricky and not entirely reliable method of working. Much better is having access to a GPS position at the time you take the photo. To do this you obviously need to have a GPS either built in to the camera (and we are starting to see this happen) or the ability to connect a GPS to the camera so that the camera can grab the position data when the button is pressed. I have had a Nikon D300 since it was released in 2007. 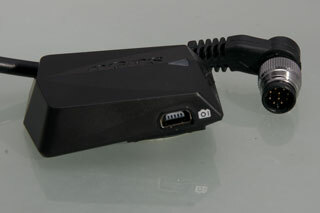 This has an accessory connector for GPS and remote shutter release. I was most impressed with the Red Hen Blue2CAN bluetooth dongle for the camera. This meant that I could use a BT GPS and get my position wirelessly. This did have a couple of drawbacks but was a great technology solution. Using the Red Hen device sometimes I didn't get position data when all seems to be working. The Red Hen device is also quite expensive at $280 especially when you need to get a BT GPS as well you would be looking at $350 (almost 25% of the price of the D300). Some time later a couple of other devices came on to the market including the Nikon GP-1 device which at $220 is better price wise. Now, however, the market has been shattered with the release of the Columbus nGPS priced at $109. Our review sample was kindly provided by BuyGPSNow.com. 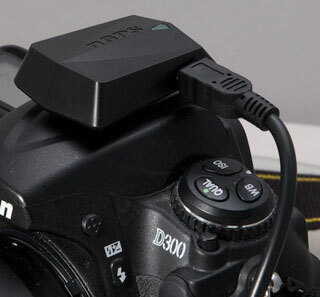 The Columbus nGPS is a neat little device that weighs just over half an ounce and mounts on the hotshoe attachment of the camera and connects to the serial connector of your camera. Not only does it allow for the GPS positioning data to be stamped on your image files, it also has a wired remote shutter release. So you get a double whammy with this device. The Columbus nGPS is compatible with the following Nikon Cameras: D3X, D3, D700, D300s, D300, D90, D2XS, D2X, D2HS, D200, D5000 and the Fujifilm FinePix S5 Pro. 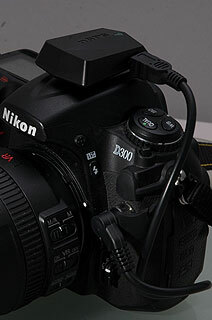 There are two camera cables provided in the package: most cameras use the Nikon 10-pin remote cable but the D90 and D5000 use a special accessory cable. 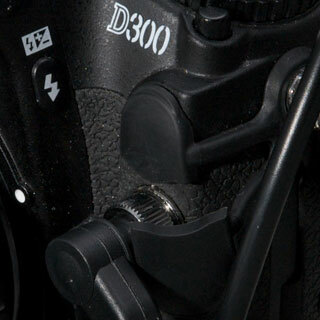 As I only have the D300 all reference to cameras in the review are specifically for this one. I am assuming that the other cameras will have similar functions and features. 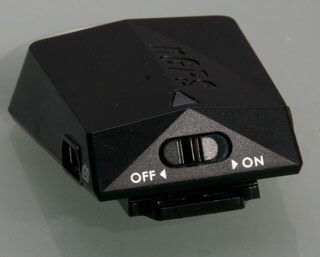 Once connected to the camera there is just a single control on the nGPS: an on-off switch. Not unsurprisingly when switched on the nGPS will start to acquire satellites and get what we term as "a fix". This means that the GPS has locked on to a sufficient number of satellites to know where it is. Whilst it is trying to get a fix the green light will be flashing, when a fix is acquired the green indicator will be steady. I should at this point mention that the nGPS does not have an internal power source. It takes it's power from the main camera battery and is not switched off when you switch the camera off. This can be important if you have a lot of shots to take before you can get back to a charger. Now there are a couple of caveats when using a GPS. The first and probably most important is that the GPS needs a clear view of the sky to get and keep a fix. The GPS chipset used in the Columbus nGPS is very sensitive and I have used it in "Urban Canyons" and in some cases indoors with a lot of success, but you need to bear in mind that this is beyond the design constraints for GPS systems so don't rely on it working indoors. The second is that it can take some time for the GPS to get a fix. Under ideal conditions you can get a fix in 30-40 seconds and then re-acquire it in within a second or two after being indoors or in a tunnel. For the techo nerds among you the GPS Chipset is the latest MTK combining both high sensitivity and low power consumption. This is one of the market leading GPS chipsets currently available. 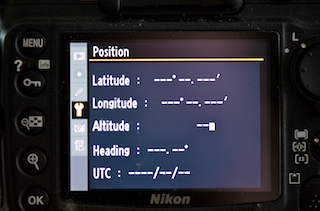 When connected to the camera the GPS section of the menu will show "Position". If you select this you will see the current positional information supplied from the GPS. If the GPS does not have a fix you will see a series of '_' in lieu of the numerical data. Once a fix has been acquired then these will be filled in with the Latitude, Longitude, Altitude and GPS time (also known as UTC). The heading data is not supplied by the nGPS. The GPS is sensitive enough for me to get a fix sitting at my desk about 3M from the window. When the GPS is waiting for a fix the GPS icon in the LCD panel will flash, when a fix is achieved then the GPS icon is solid. The next thing was to take the kit out for a quick test. I was lucky enough to have a friend from Taiwan staying with me for a while so I took the opportunity to do the tourist bit. My minimum requirements were that the camera's power should last at least 1 day without difficulty and that all my pictures would get a position logged. A main test requirement was to have the nGPS on continually throughout the day. I normally turn the camera on and off as I need to but I wanted to see how much the GPS would drain power and if it would keep a fix all day. I wanted to test the Columbus nGPS in a number of different environments so we headed into London and took a trip up the Thames. As expected when we were on a boat on the Thames the reception was perfect, but getting to the boat involved going into a tunnel under the river when I lost my fix. The GPS regained its fix immediately we came out of the tunnel, before I got my breath back from climbing the stairs. When we moved into the city the GPS handled a number of increasingly difficult scenarios admirably. Losing the fix when underground on the London Tube, but regaining it quickly when coming outside again. The tall "Urban Canyons" didn't phase it, and in some circumstances it even worked indoors, particularly inside churches (and in a Pub in Stratford-upon-Avon). One thing to be aware of is that the nGPS uses power from the camera's battery. This means that if you normally chew up the juice in a battery quickly then you need to be doubly cautious with the usage of the nGPS. From my experiences the GPS doesn't use very much power, but as it all comes from the same source, power management is something that needs to be practiced to get the most from your battery. 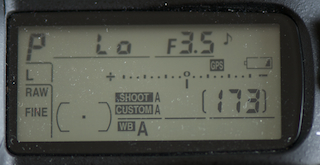 Note that the power to the GPS is independent of the main switch on the camera, and needs to be powered on and off on the device itself. After leaving the GPS on all day and taking over 250 pictures I arrived home with over 50% power in the battery, I used the onboard flash a few times, but not that often. I have now captured my masterpieces and need to transfer them to the computer. Fortunately the GPS position along with all the other image metadata is stored in the picture file along with the actual graphic. This means that when you copy the file all the captured information is transferred with it. I am a "Mac Man" so my management applications are either iPhoto or Aperture. I actually use Aperture as my main archiving tool. Aperture is great for professional (and pro-am) photo finishing, and I would recommend it to any serious digital photographer. iPhoto 09 actually is more location aware than Aperture, aimed mainly at the consumer market. It can be a great application for storing and viewing your images. iPhoto 09 has a number of different geo-aware features which include Push-pins on a map, and reverse-geocoding which converts the GPS co-ordinates into a place name. In either case the location data is saved and passed on when you export the pictures to other applications. Aperture and iPhoto can be used to crop and touch-up your images prior to publishing them on the Internet. Most photo sites now have functionality that incorporates location data. In the days of social networking location is often as important as what you have to say, and nowhere it that more true than for landscape photography. Thanks to the geo-tagging or geo-referrencing of pictures I never have to either make notes (which I do badly) or try to remember (which I do worse) for each of my photo shoot locations. Back in the days of wet film I used to try and rigorously try to record exposure details, but not with digital the camera logs everything for me. If you have one of the Nikon Cameras then the chances are that you will also have the Nikon ViewNX application as well. 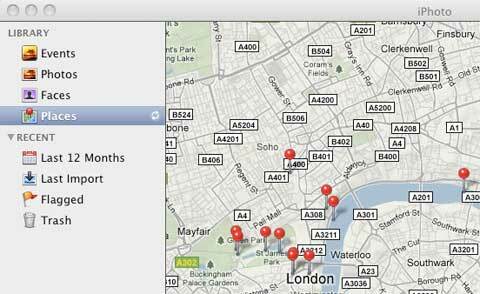 This software is also location aware and can position your images on a map within the application. I must confess that I have never used this but it is both Mac and PC compatible. 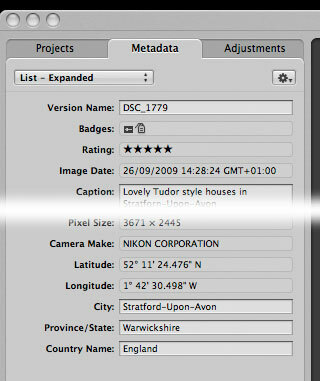 One thing you do need to be aware of is using your geo-tagged images in a graphics application such as Photoshop. Some of these applications will remove all the meta-data in the image file when you come to save it or export it. Make sure you always keep a master copy of your images so that if the worst should happen you can go back and start again. Currently my favourite Internet application for displaying and sharing my images with friends is Google's Picassa, but there are many other geo-aware sites out there. One of the good ones to choose is Panoramio which is the source of geo-tagged pictures for Google Earth. I have listed some others in the resources section below. Click here for a selection of my test pictures in Picasa, or here for the Picasa map view. If you have one of the listed Nikon Cameras: D3X, D3, D700, D300s, D300, D90, D2XS, D2X, D2HS, D200, D5000 or the Fujifilm FinePix S5 Pro then this could be one of the best accessories you can get for your camera. I found the GPS to be accurate and very easy to use. The only real problem I found was that the flash on my D300 would not open when the nGPS was mounted, but the GPS can easily be moved off the hotshoe, and either left to dangle or can be attached to the camera strap. Product page on BuyGPSNow web site Columbus nGPS. Special 20% discount offer for PocketGPSWorld Subscribers. My Columbus nGPS sample images Picasa Website. what does it mean when it says it does not 'come with heading information' ? The heading information is the direction that you are travelling if you are moving. This information is not passed to the camera or stored in the image file. Thank you for the great review. I have two questions. 1. Can the onboard flash be raised with the GPS in position? 2. Based on your knowledge is the SIRF star III chipset better or the MTK chipset better?